If you’re looking for good food for your puppy lab, let us help you choose some. We know it’s a big difficult at the start so we’ve hand-picked the best food on the market. Every puppy owner wants the best for their beloved pet. However, if you are a first time Labrador puppy owner, then choosing the best puppy food for labs can prove to be as daunting as ever. Asking advice from friends and family can only help so much, with everyone having their own opinion of what and how to feed your puppy. Some pet owners will tell you to only feed your puppy dry dog food such as kibble, while others will insist that home cooked food is best. Those who had puppies in previous decades will tell you that they fed their puppies’ scraps, raw meat and canned food. You will always have to hear people’s opinions about what type of puppy food is best. Some will swear by the health benefits of canned food, while some will say that all your puppy needs is kibble and now day a select few are into feeding puppies natural of raw food. However, you still want what’s best for your puppy, so it’s a good idea to do your own amount of research into the best puppy food for labs. The type of puppy food you choose to feed your lab is entirely up to you, as long as you stick to the Labrador puppy feeding guide. Labrador puppy food recommendations are always offered online, if you are ever confused about what to feed your puppy and what not to. Also remember that no two puppies are the same, so the best food for lab puppies is entirely up to your discretion and your puppy’s well being. Before deciding to put your lab puppy on any specific puppy food, speak to the breeder and find out what puppy food he currently is on. Taking your lab puppy to his new home is stressful enough on him, without him having to deal with a brand new diet. Try to keep your puppy on this same puppy food, for a couple of weeks, even if you don’t prefer it, just until he is settled into his new home. Thereafter, you can gradually switch him over onto his new diet. These few weeks together will also allow you to observe whether he has any food allergies or if he has any preferences as well. You can use this information, coupled with facts about your Labradors breed to decide on what type of lab puppy food would be best for him. Below are a few Labrador puppy food recommendation reviews that you can use to help make your decision. The Royal Canin Labrador Retriever Puppy Food is a unique kibble that is custom produced for each pup. However, the shape, size and texture of the kibble are suitable and adapted to Labrador puppies. This puppy food adds to the development of the Labs bone structure while promoting healthy weight gain. It provides a good amount of calcium, protein, energy and phosphorus. Lab puppies need extra help with digesting certain nutrients, since their systems are not optimally developed as yet. This Labrador retriever puppy mix is designed to help aid digestive functions and supports intestinal balance and harmony. Most puppy owners consider this to be the best dog food for Labrador puppy because it contains a range of vitamins such as vitamin C, E, Taurine and Lutein which all act as a natural defense against disease and sickness. It is suitable for Lab puppies aged as young as 2 months to around 1,3 years old. Some Lab puppies have a tendency to vacuum up their food at meal times. According to various customers, the Royal Canin Labrador Retriever Puppy Food has helped to curb this habit and also aided with digestion. Lab owners who currently feed this dog food to their puppies admit that it gives them shiny coats and clear eyes, which basically tells you that the puppy food is filled with comprehensive nutrition for your lab puppy. The recommended daily servings for your Lab puppy are included on the back of the packaging and it is just a guide. However, you should use it to make sure that you are giving your Lab puppy portions that are appropriate for his body weight. It also tells you how many times a day he should be fed for his age and body weight. 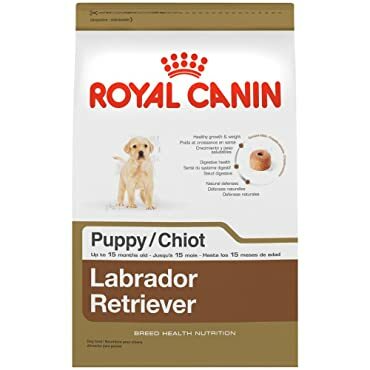 As much as this product is healthy and full of nutrition, you should bear in mind that every puppy is different and if yours doesn’t take to the Royal Canin Labrador Retriever Puppy Food, then there are other types of puppy food out there that he could prefer. This product is your puppy’s balanced and complete daily diet. You do not need to feed him anything else other than water, if he is on this puppy food. It contains more than enough minerals to promote proper development of bones. The natural DHA sources support, healthy brain functioning and growth. He increased levels of protein aid muscle growth. 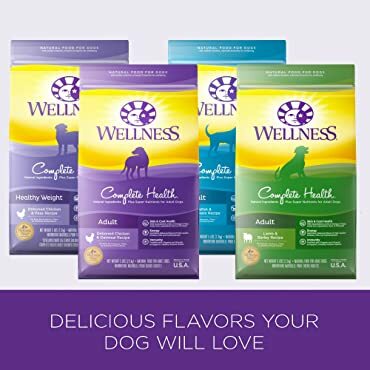 The Wellness Complete Health Natural Dry Puppy Food contains deboned chicken, salmon and oatmeal with DHA for healthy eye and brain development. It does not contain any fillers such as corn, wheat, artificial flavors, soy, preservatives and colors. It is also made in the USA and backed by their wellness guarantee. If you are wondering if this could be the best puppy food for Labs, after introducing it to your puppy, watch out for these signs. After a month of two, you should notice a healthy skin and coat, improved digestive health, energy, immunity and healthy teeth, gums and eyes. 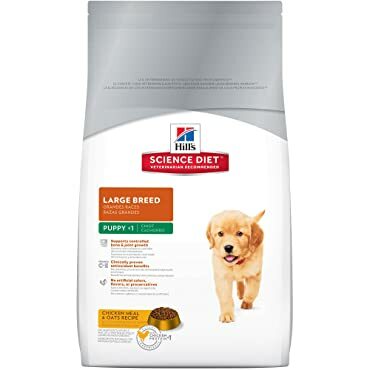 The Hill’s Science Diet Large Breed Dry Dog Food is a combination of natural ingredients as well as minerals, vitamins and amino acids. It also supports controlled joint and bone development, while having clinically proven antioxidant benefits. The product contains no artificial, colors, preservatives or flavorings. 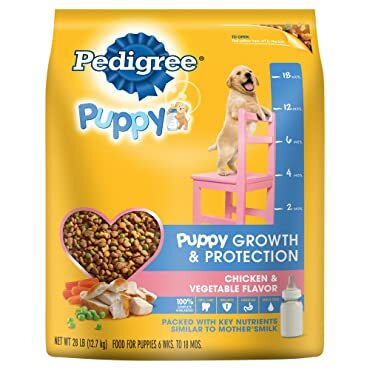 The manufacturers of this product are so confident in this Lab puppy dog food that they back it up with a satisfaction guarantee or your money back. This dog food is developed and intended for use by large breed dogs. You cannot feed it to dogs that are pregnant and nursing because of its lower calcium and energy density content. The product also doesn’t have an overly pungent smell, like other puppy and dog food and the bite sized pieces are just right for puppies. Feeding your puppy this dog food will give him a healthy and shiny looking coat. According to some reviews, this product can help dogs that experience excess shedding of hair. The shiny coats are just one benefit of feeding your puppy the Hill’s Science Diet Large Breed Dry Dog Food, because you may also notice that his teeth are cleaner and his breathe smells a whole lot better. According to many reviews this dog food has proven to be effective in preventing diarrhea in puppies with a sensitive stomach. Stools are also significantly more consistent and solid. This chicken meal and oats recipe is delicious and all he instructions needed to feed it to your dog are available with the product. The PEDIGREE Complete Nutrition Puppy Dry Dog Food is made to help your puppy keep up with the other, older dogs. It contains DHA for strong and healthy bones and teeth and healthy brain development. Your dog will love the chicken and vegetable flavor. It is also crunchy, which is another reason why dogs love it. If your puppy finds the chunks a little too hard, you can drizzle some water over it to make it more manageable in texture for your puppy. Aside from being able to curb stomach and digestive system problems, this dog food is increasingly popular because of its ideal pricing. While sold at between $25 – $27 in stores, it is sold for around $20 online, which makes it a more economical choice for Lab puppy owners. The PEDIGREE Complete Nutrition Puppy Dry Dog Food contains all the nutrition that your Lab puppy needs, so all you need to give him in order to compliment his diet is water. Other than that, all vitamins, minerals and nutrients are provided within this dry dog food. It has been said to help many puppies get their immune and digestive systems back again. Puppies that are prone to diarrhea can eat this puppy food and regain a better consistency of stools and also enjoy an increasingly better immune system. Signs that your puppy is benefiting from this puppy food will be evident if you see a healthy and shiny looking coat, clean teeth, strengthened immune system and overall better health. You will also notice that his stools are firmer and less frequent, which means more of the nutrients that are needed for your growing Lab are staying instead as opposed to coming out. It also comes down to what your puppy likes. While most puppies will eat anything that is put in front of them, some of them develop a preference for certain textures and flavors and they will eat nothing else. If they do eat any other flavor or texture, it will be very reluctantly. You are also welcome to feed your puppy treats, to reward him for finishing a meal. Bear in mind that you should choose healthy treats such as carrot and apples, instead of cookies and highly processed treats. Since your puppy is a carnivore, you will only need to treat him to a small piece of fruit every now and again. All other nutrition needed for him to grow and thrive should come from the best puppy food for labs that he is currently on.